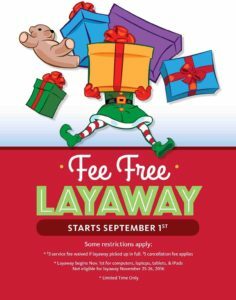 GRAFENWOEHR, Germany — Once again, the Army & Air Force Exchange Service is offering fee-free layaway for Soldiers, families and retirees who want to get a jump-start on their holiday shopping and keep gifts hidden safely out of sight from prying eyes. Starting September, the Tower Barracks, Rose Barracks and Hohenfels Exchange will waive the $3 service fee for items that are placed on layaway and paid for by Dec. 24 — including toys and bikes. Purchases of $25 or more are eligible for the layaway plan. A deposit of 15 percent is required to hold items on layaway. Shoppers can visit customer service at the Tower Barracks, Rose Barracks and Hohenfels Exchange for complete program details and eligibility information.